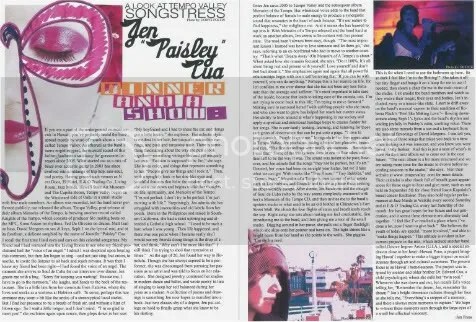 Vocalist Jennifer “Paisley” Cua drifts on stage, closes her eyes and takes the mike. Her vocals are pretty and dreamy; her lyrics speak of cautious optimism in trying times. The song is a mellifluous, slightly tropical balled called “Treehouse.” Other compositions — with titles like “Opium,” “Femme Nu,” “Dream Away” and “Not Your ‘Fluffer’ ” — arrive equally hush and shy or more sinister of beat and sound. Sometimes, the songs work both worlds. 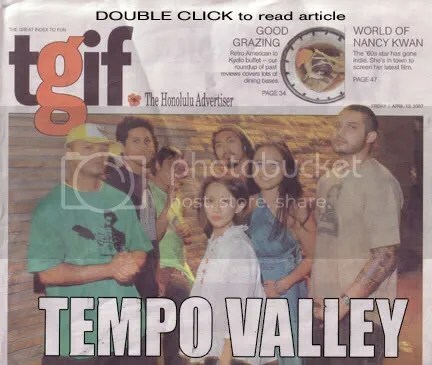 And so goes another Saturday night of Honolulu-based music collective Tempo Valley working its atmospheric, otherworldly melange of downtempo hip-hop, jazz, neo-soul, trip-hop, slightly psychedelic world beat and occasional oddball sonics. Wicked inventive, funky eclectic and trippy original, the music of Tempo Valley showcases a gathering of musicians who have gained a loyal, growing grass-roots following. It’s also a gathering of musicians about to release its first collection of music, “Memoirs of the Tempo” — unfinished versions of which have been passed around enough in the last year to earn Tempo Valley that growing grass-roots following.